Abrasion of markings and letterings caused by rubbing of fingers and hands. 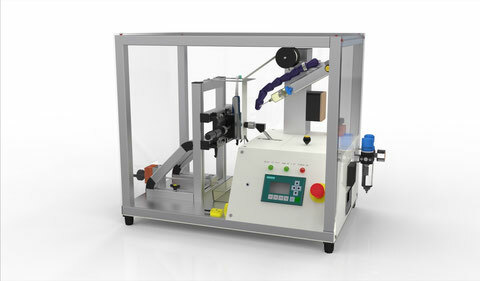 The Abrasion Tester is used to simulate hand abrasion on surfaces of toothbrushes and printings. The test is performed in accordance with the European standard DIN EN 60068-2-70 / IEC 68-2-70 (Test of resistance of labels and texts to abrasion, caused by rubbing of fingers and hands). The test expose the surface under investigation a practical as possible modeled on manual operation. In the mechanical load a dolly is performed at an angle of 45 ° with a distance of 4 mm and a defined pressure force on the test surface. The force causes an elastic deformation of the printing and a rubbing motion on the surface. In addition to the mechanical loading the chemical resistance can be tested. In this case, applying a mixture of toothpaste and artificial sweat during the test onto the surface. Number of Cycles: 1 bis 10 Mio.